Dreaming of a trip to Patagonia? We did too for many years, and recently we finally took the plunge. Planning a trip to Patagonia and traveling within this remote southernmost region of Chile and Argentina can be a daunting task given its sheer size. After all, it's a place where you can get very lost...and some folks go to hide. This post may contain affiliate links. If you click through and make a purchase, we may receive a small commission at no additional cost to you. 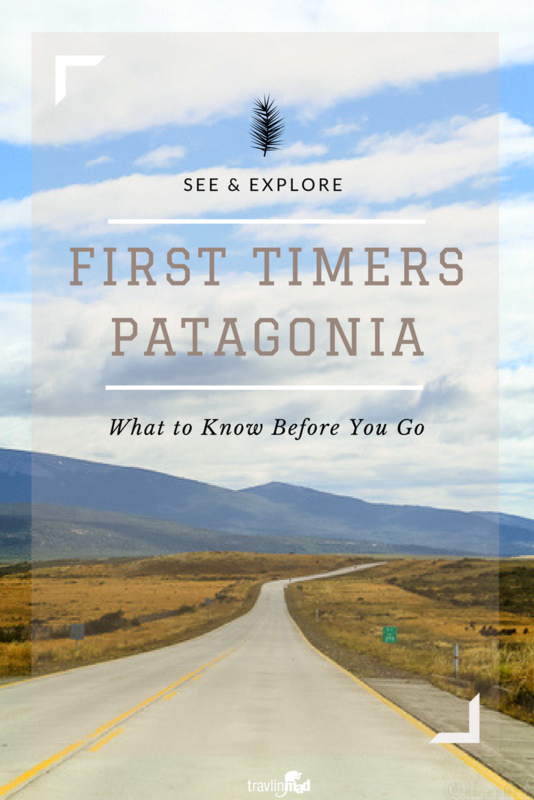 Your very first thought right out of the gate will probably be about the best time to visit Patagonia. Ours was. We live in the northern hemisphere so we needed to adjust our thinking first. We decided on February-March, which is late summer-early fall in Patagonia. A beautiful, but popular time to visit. After months of discussion and changing our minds about where to go and what to see, we settled on an itinerary which hit the most important places: Chilean Patagonia and Torres del Paine (pronounced PIE-nay) National Park, Argentinean Patagonia and Tierra del Fuego in Ushuaia at the "end of the world", the Atacama desert in the far north of Chile, and finally Santiago. We decided to leave the 4,000 mile side trip to Easter Island for another time! Day 1 Depart U.S. for Santiago. Santiago to Punta Arenas (+ 1 day). Day 2 Arrive Punta Arenas mid-day. Pick up rental car, drive to Puerto Natales, and overnight. Day 3 Drive to Torres del Paine, 5 nights. Day 8 Depart early am, drive to Puerto Natales, drop off rental car. 7:00am bus from Punta Arenas to Punta Arenas, connect with bus from Punta Arenas to Ushuaia, Argentina, 3 nights. Day 11 Depart Ushuaia. 8:00am bus from Ushuaia to Punta Arenas, 3 nights. Day 14 Depart Punta Arenas for Santiago. Santiago to Calama/Atacama, overnight 5 nights. Day 19 Depart Calama/Atacama to explore Santiago, 6 nights. Day 24 Depart Santiago for home. 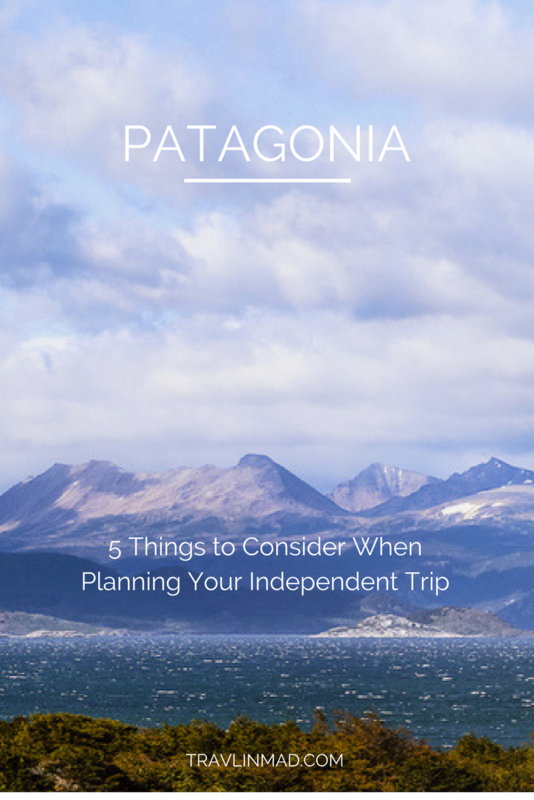 Unless you’re taking organized Patagonia tours (which we were not), planning an independent trip to Patagonia can be tricky. When I first started planning our month-long trip, I had no idea what we were in for. The more we researched, the more questions piled up. Our biggest challenge was how best to get around without breaking the bank but still allow us flexibility. We’re not hitchhikers or backpackers, though we found out from many of them on the road that they felt safe, even solo female travelers. We travel moderately - somewhere between Budget/Backpacker and Luxury, saving money where we can but still with occasional luxurious splurges here and there (like a nice massage after a long day of Patagonia hiking). We travel independently. It's difficult being constrained to the schedule of a large tour when you're taking lots of pictures, and we love the flexibility of being on our own. If you like to travel that way too and have dreamed of hiking in Patagonia, photographing those epic views, and exploring this remote part of the world, here are a few logistical things to consider as you make your plans. Patagonia is huge! To say we’ve traveled there seems almost absurd given the enormity of the entire region - and we covered a lot of ground. Have you seen Chile and Argentina on a map? Chile is a long, narrow country - 2,653 miles long (4,300 km) but only a little over 100 miles wide. It appears to be squeezed to the westernmost edge of the South American ice cream cone by Argentina. By comparison, Argentina is 2,268 miles long (3,650 km) and takes up nearly the entire peninsula. Patagonia falls south of Puerto Mont in Chile. One could easily spend years here exploring Patagonia. Tourism to Chile is just developing, and each year there are more opportunities for remote adventures all around the country. But it's still developing. The point is this: the vast distances between places means it takes a good amount of time, money, and coordination to get around. Travel to Patagonia isn’t cheap but it’s so worth it. The wide open road from Punta Arenas to Puerto Natales is one of the most scenic drives in Chile. When it comes to getting in and out of Patagonia, your choices are to fly, take a bus, rent a car, ride a bike, or hire a private transport. It all depends on your budget and how you want to experience it. Biking Patagonia is a big thing. These bikes outside the Chilean Customs Office and Border Crossing at San Sebastian sported the blue and yellow flag of Patagonia. You can get to Patagonia by plane, boat, bus, bike, or car. Santiago is roughly in the middle of the country, and driving from there to Patagonia will take you 31 hours, unless you stop to take in the unbelievable scenery - which of course you have to - so add another few hours on to that. We wanted to get to Patagonia right away so we flew from Santiago to Punta Arenas at the southern tip of Chile via LAN Airlines. TIP: Don’t confuse Punta Arenas with Puerto Natales near Torres del Paine - they are two very different towns and three hours away from each other. Also, Torres del Paine National Park is another hour west past the town of Puerto Natales. If you're wondering how to get to Torres del Paine, you should know this: everyone planning a visit to the National Park must pass through the backpacker town of Puerto Natales (about an hour's drive to Torres del Paine), and there are several ways to get there from Punta Arenas. Fly - A short 25-minute hop from Punta Arenas lands at Gallardo Airport (PNT), 6 miles from the town of Puerto Natales. Flights into here have been sporadic at best but that's rumored to change as plans to expand it unfold. But for now, SKY Airlines offers flights a few times per week in the high season through the end of February. Private transport - around $60-$75 USD per person. Bus - several buses provide service between Punta Arenas and Puerto Natales, Puerto Natales and El Calafate, Punta Arenas and Ushuaia, and Puerto Natales and Ushuaia. Buses Fernandez, Buses Pacheco, and Bus Sur are three of the best, with clean safe, and comfy rides. Reserve your tickets online. There are no direct buses from Punta Arenas to Torres del Paine National Park; first you must stop in Puerto Natales. Rental Car - There are several to choose from at the Punta Arenas airport with all sizes of 2WD/4WD cars. Check online and your own auto policy and insurance to see what rates/restrictions/coverages apply. Horses grazing near Torres del Paine National Park. We rented a 2WD, compact car for a week, with a specially-arranged early morning drop-off in Puerto Natales, for $400 USD/week. We booked online ahead of time with EMSA Rent A Car, a subsidiary of AVIS, and were very pleased. We were so glad we rented a car for this drive. It’s one of the most beautiful scenic drives in Chilean Patagonia. Pick up the two-lane highway to Puerto Natales right next to the airport. The road is flat, in good condition, and with very mild traffic (but enough if needed, in the event of an emergency). Driving independently means you can stop whenever you want for as long as you want. Many travelers combine a trip to neighboring countries when visiting either Chile or Argentina. The Perito Moreno Glacier, El Calafate, and nearby El Chaltén in Argentina are hugely popular, and an easy 4-5 hour bus ride from Puerto Natales. But for us, we couldn’t imagine coming all this way to Torres del Paine in southern Chile without seeing The Southernmost City in the World - el fin del mundo - in Ushuaia Patagonia in Argentina. This port city in Tierra del Fuego is the jumping off point for travelers heading to Antarctica and considered by most people to be the true ‘end of the world’ city. Sounds great, right? It’s 14 hours away from Puerto Natales! You'll cross the Straits of Magellan on the Patagonia ferry on your way to Ushuaia. About a dozen cars, tractor trailers and 50 or so passengers made the crossing. Your options to get to Ushuaia are to fly, take a bus, or rent a car and drive. Fly - Flights to Ushuaia from Punta Arenas are very expensive, ranging from $600-$1200 depending on the time of year, and number of stops. Very often you'll fly to Santiago first, and then back down again, making for a longer trip than ground transportation. Rental Car - Renting a car and driving across international borders carries additional fees from car rental companies and potential fees from Argentina. Bus - There are several first-class tourist buses with service to Ushuaia out of both Punta Arenas and Puerto Natales. Bus Sur offered good rates, so we reserved our tickets online months ahead of time. Our round trip cost, per person was $122 USD (Puerto Natales - Ushuaia, $67 USD; and Ushuaia - Punta Arenas, $55 USD). We were already in Torres del Paine and didn’t want to drive back to Punta Arenas, so the early morning bus from Puerto Natales to Ushuaia worked for us, and we returned to Punta Arenas. Don't let the 14 hour ride dissuade you. Bus Sur was more comfortable than our economy class flight, plus it was air-conditioned and curtained to keep out the bright sun, and made plenty of stops along the way. You could stretch out and sleep, grab lunch, cross on the ferry over the Straits of Magellan, and take in the sites of the Argentinean countryside. Honestly, I thought it was a great way to travel - we saw a part of the country we'd never have seen if we flew. Welcome to the End of the World! Our first few nights in town, we stayed a lovely mid-range hotel on the outskirts of town, Tierra de Leyendas, which overlooks the Beagle Channel and has the most fabulous breakfast in Ushuaia. You can check rates and more details here. If you want to see what it's like to be Leonardo DiCaprio for a day who stayed here while he filmed The Revenant, stay in absolute luxury at Arakur Ushuaia Resort & Spa. The hotel's organic, modern design is warm and comfortable, the food is fabulous, and their heated indoor-to-outdoor pool (with swim out passage) and jacuzzi spa that overlooks the lights of Ushuaia and the Beagle Channel is off the charts amazing! Check rates and more details here. Here’s the thing. If you’re used to having a gas station on every corner or at least within a mile or so from your home, consider that petrol in Patagonia can be hard to come by. I don’t know why exactly. Not only are petrol stations few and far between there, but occasionally they'll run out of gas. Drivers are encouraged to tote along bottles of gas for the road especially if you’re planning on driving great distances. If you plan to stay in one region, like the southern region between Puerto Natales/Torres del Paine and Punta Arenas, a tank of gas will get you safely between the two. The most colorful backpackers I saw, and this girl made her own colorful backpacker dolls for extra cash along her journey! The ginormous size of Chile and Argentina means it can be expensive to travel around. You’ll see lots of intrepid backpackers with their thumbs stuck out along the road, or carrying all of their belongings on their back and walking from place to place to save on expenses. That’s great if you have the time, youth, or inclination to do that - we did not. That said, however, there are ways to keep costs down. For example, consider a hostel or Airbnb if you're only spending a day or two in jumping off points like Puerto Natales. We found two excellent accommodations in Puerto Natales and Punta Arenas for a few nights with low rates and great locations. Also, get restaurant recommendations from locals on the different foods to try in Chile and where to try them. The prices should be lower and you'll likely get a great meal. Credit cards are widely accepted in both Chile and Argentina and most banks also have ATM machines, however you should expect fewer bank locations in certain areas. Punta Arenas has numerous national and international banks around the city and you can access your accounts for a small fee. Puerto Natales had only a handful of bank locations with an ATM machine. There are no banks located inside the Torres del Paine park so take enough cash with you while you’re there. Ushuaia also has numerous national and international banks with multiple ATMs around the city. However, when we arrived in Ushuaia from Chile late on a Saturday night, four different banks we visited had already run out of cash, leaving us and dozens of other travelers wondering what to do next. Thankfully our cab driver accepted US dollars and we were able to take a cash advance the next day. This problem wasn’t unique to Ushuaia or Argentina. We understand this happens from time to time around Patagonia. Best to always have a small amount of local currency on hand. These 5 logistical items were the most common questions that arose again and again in our months of planning for Patagonia. Thanks to help from fellow bloggers and lots of great information we received, our first trip most definitely will not be our last! I'm happy to help with any details you might be wondering about. Just shoot me an email through the Contact box on my homepage. Trip planning can be overwhelming, but no one can write the details of your own travel story like you! Cheers!